The Nigeria Labour Congress (NLC) is insisting that the Federal government reverts to N65 per litre in the current controversy over subsidy removal. This is my take on what will happen if government returns to any form of price fixing for fuel prices. 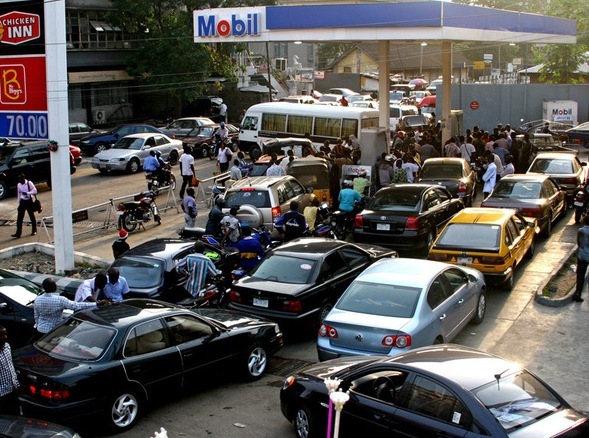 Nigerians should immediately be prepared for a prolonged period of unstable fuel supply and the return of queues at the fuel stations. There are several factors that will lead to this situation. The first and immediate reason is the pile up of ships at Nigerian ports said to be unable to discharge their cargoes because of the five day strike so far. This definitely means even if the strike is called off today, there is still bound to be some form of scarcity considering the NNPC reserves may likely not hold long enough to prevent it. The bigger problem Nigerians should expect to face if the FG reverts to N65 per litre is the reluctance of major fuel importers to go back to importation after being demonized in the whole fuel subsidy controversy. In this whole controversy, instead of being made to look like the normal business men who saw a good business opportunity to make easy money, they have been made to look like thieves stealing from the public purse. Their portrayal as a stealing cabal feeding fat on public wealth has put at risk their lives and businesses with reports of their head offices and personal house being picketed and some narrowly escaping death from angry mobs. The likely implication of this demonization of the major fuel marketers is the possibility that some of them may willingly give up the importation of fuel either temporary or reduce their involvement on a long term basis. This will have dire consequences, since the major importers have the facilities and network that are needed to get fuel into the country. With refineries down, NNPC having limited capacity to import to meet local demand, the likely consequence of any move by the major marketers to reduce their involvement in fuel importation will be an acute scarcity of fuel in the country. This is not scare mongering. It is the basic fact that most Nigerians would not want to listen. NNPC does not have the capacity to meet Nigeria’s local fuel demands and should not be relied on to get the refineries working. They have proved their incompetence in that direction over several years. They cannot change overnight. I see a resurgence of the black market developing immediately after the strike with a litre fuel selling far above the deregulated price of N141 per litre. I also think the black market will not be a temporary one. We are likely to see a prolonged black market situation as new marketers and NNPC try to fill the gap left by the major marketers. There is also the challenge that the major marketers know that the government is in a dire financial situation and may not be in apposition to pay for subsidized fuel as easily as it has done in the past. This may also discourage some of them from importing if they are not certain of being paid fast enough. So, if we get N65 per litre official price, be prepared to pay N200 per litre in the black market or sleep at the fuel situation. It will simply be because you asked for it, so do not blame your Goodluck on Jonathan when it happens and remember you read it here first.